Early next year, I’ll be casting some 48pt Floriated Caps (occasionally, and unofficially, known as “Gill Floriated”). The last time I cast some, I used this synopsis… A4 B3 C4 D4 E4 F3 G3 H3 I4 J3 K3 L3 M4 4N 3O 3P 3Q 4R 4S 3T 3U 3V 3W 3X 3Y Z2 …which came to £125 plus shipping; I expect it’ll be similar this time. At the suggestion of @incline_press, I also kerned some of the sorts that would benefit from it, and put in a high space to support the kern when needed. If you’d like a fount, please email me on effrapress@gmail.com. 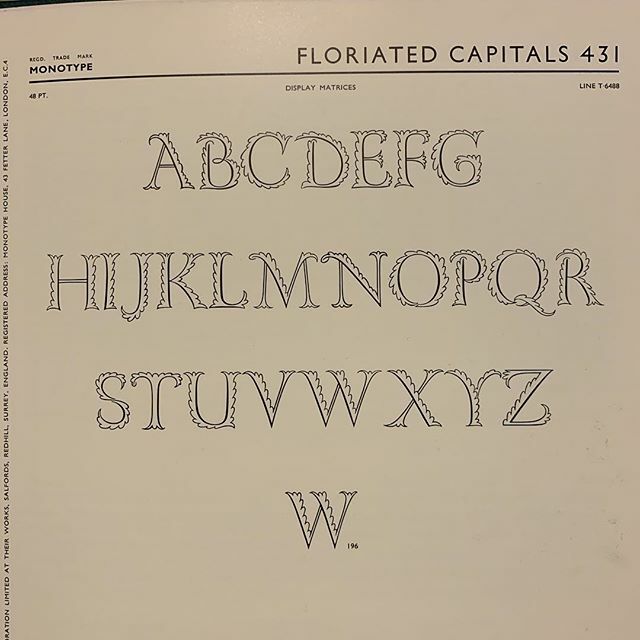 Early next year, I’ll be casting some 48pt Floriated Caps (occasionally, and unofficially, known as “Gill Floriated”). The last time I cast some, I used this synopsis… A4 B3 C4 D4 E4 F3 G3 H3 I4 J3 K3 L3 M4 4N 3O 3P 3Q 4R 4S 3T 3U 3V 3W 3X 3Y Z2 …which came to £125 plus shipping; I expect it’ll be similar this time. At the suggestion of @incline_press, I also kerned some of the sorts that would benefit from it, and put in a high space to support the kern when needed. If you’d like a fount, please email me on effrapress@gmail.com.